Set in a jackpot location overlooking the azure blue waters of the Gannel Estuary and golden sands of Crantock Beach, step into the ultimate coastal luxury and experience the holiday highlife in Cornwall. River House offers 5 boutique bedrooms, 5 contemporary bathrooms and a wonderful open plan layout of social spaces all set to the backdrop of sand and seascapes. 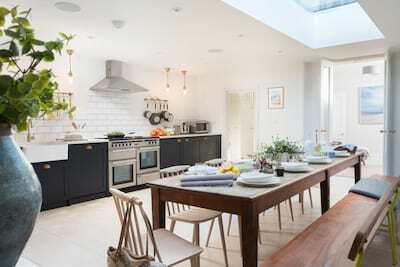 From the moment you arrive, soak up the wonderful sense of light and space as you sink into a very Cornish way of coastal life at River House. Thoughtful interior design and inspired architecture combine to complement the location. The house is set over three floors with the open plan living, dining and kitchen space on the middle floor, 4 luxury ensuite bedrooms on the lower floor and indulgent master bedroom set on the upper floor. From milestone celebrations to lazy summer stays, enjoy the luxury of the location and aspirational living at River House. 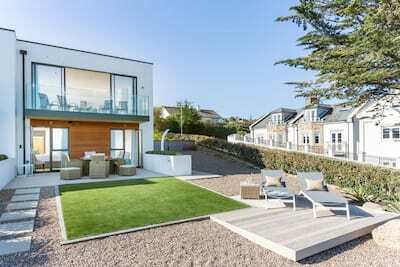 Slide back the glass doors to reveal the fresh Cornish air. 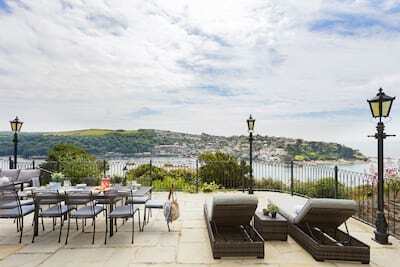 Dine alfresco at the large dining table and chairs with the blue waters of the Gannel Estuary below you. 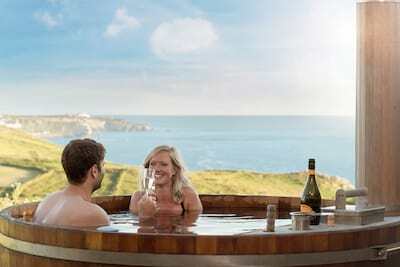 Watch the ebb and flow of coastal life from your elevated vantage point and soak the bustle of everyday life away in the bubbling hot tub set back into the cliffs. The Pentire Headland has so much to offer as you step from holiday door to sandy shore in moments. Walk to Fistral Beach or Crantock Beach each offering superb surf and wide stretches of golden sand. There are number of tempting places to eat and drink from the family friendly Lewinnick Lodge to the culinary tempations of The Fish House. The North coast of Cornwall is waiting to be explored as you head up the coast towards Padstow or head to the wild West and the iconic town of St Ives. Master bedroom: first floor. Superking size bed and an ensuite bathroom with walk-in shower. Amazing views with sliding windows, armchairs, built-in wardrobe, chest of drawers and 32" TV. Bedroom 1: Lower ground floor. Superking size bed with an en-suite bathroom with walk-in shower. This room has built in wardrobes and dressing table, access through sliding patio doors onto the balcony and wall mounted TV. Bedroom 2: Lower ground floor. Kingsize zip and link bed with an en-suite shower room, built -in wardrobes, dressing table and access through sliding patio doors onto the balcony. Bedroom 3: Lower ground floor. Kingsize zip and link bed with an en-suite shower room, built -in wardrobes, dressing table and access through sliding patio doors onto the balcony. Bedroom 4. Lower ground floor. Superking zip and link bed with an en-suite bathroom and walk-in shower. This room has built -in wardrobes, dressing table and sliding patio doors with a Juliette balcony and also a door onto the balcony. This room has a wall mounted TV. Utilities include: washing machine and tumble dryer, iron with ironing board. 2 dogs are welcomed at River House, Crantock and Fistral beaches are dog-friendly throughout the year. The drive way has a steep slope but also a level gravel area. There area approx 10 steps down to the front door. There is level access onto the upper balcony. To access the lower terrace there is a spiral staircase with handrail. There are 2 internal flights of stairs. On the lower ground floor there are 3 further steps to access 2 of the bedrooms. Incredible house with everything so well thought out. It has been a privilege to stay here. Thank You! Superbly equipped, fantastic views, fantastic break. We have had a wonderful stay. Natures window served us with amazing views, what more could you need. An amazing house with stunning views and a fantastic interior. We love it was wonderful to able to walk to such beautiful beaches and restaurants. We have been searching for the best holiday home in Cornwall. We think we may have found it. The house is OUTSTANDING in every way. It was the perfect choice. River House has been brilliant, spectacular views. We will be coming back. Amazing views, beautifully decorated. Everything you could need was to hand. There are not many places where we would unreservedly wish to return the following year, we have found that place in River House. It was an amazing week. Stunning location and views. C'est magnifique! Wonderful location, Spectacular views, very well equipped house, all contributed to a most memorable and enjoyable week!! We look forward to seeing River House on Fantasy homes by the sea. Thank you for an amazing stay! The house is stunning and the views are incredible. We have watched at high and low tide it would never get boring!